Pops for Pop! Order by Saturday, delivered on Father's Day! Father's Day is just a couple of days away. It is an opportunity to tell your father what his love and support means to you. It's tough right? Our idea is to give him what he wants most from hs children: Quality time! Time spent watching the game, golfing, fishing (cleaning the garage or the basement? mowing the lawn?) or maybe just hanging out enjoying a meal including a fun dessert! 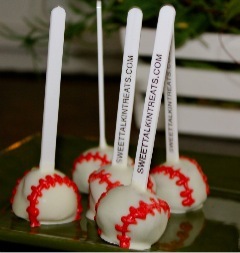 We recommend Cheese Cake Lollipops! • Things I love about you Dad: You are wise & understanding, your love is enduring & generous, you are both tough & gentle. • When I think of you Dad, I think of strength - the strength of a man who has always stood beside me and encouraged me to be my very best. • This may not be Webster's definition of Dad, but it is mine: Understanding, hard working, caring, loving, honest, wise, dedicated, tough, smart, handsome & funny. • When I think of you Dad I think of respect - the kind of respect that inspires others to do the next right thing. • When I think of you Dad, I think of wisdom. Wisdom sometimes disguised as a joke, or a warning, or a flat out NO! • Dad, it's time you knew that I know " Drink your milk! ", "Be home by 10! ", "Be patient" and "You are not leaving the house looking like that!" meant "I Love you." First, you mix together egg whites and sugar in a metal bowl. 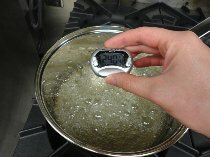 This mixture is heated over simmering water until the sugar is completely dissolved and it reaches a safe temperature of 160 degrees F.
Next the mixture is poured into a mixing bowl and whipped until stiff peaks form and the bowl is cool to the touch. When the egg white mixture is ready, butter is added (lots of butter!) gradually as the mixer continues mixing on a medium speed. 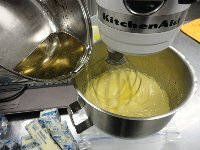 When all the butter is incorporated, flavoring is added (such as vanilla extract). 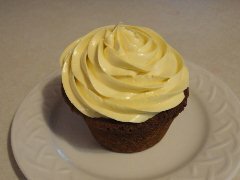 The final result is a deliciously smooth, white icing with a very buttery flavor and just the right amount of sweetness. You won't be complaining about this being "too sweet" like I hear so often about traditional bakery frosting (like the kind you get at most grocery stores). Beautiful Spring Cake to Make at Home! Easter is just 2 days away! 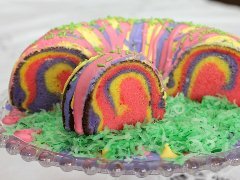 In case some of you missed the deadline to put in your Easter dessert orders, I found this super cool cake recipe on the Betty Crocker website. It's easy to make (though it will create a few extra dishes to do with all the different colors!) and it looks gorgeous! I can't wait to try this using my own cake recipe! (P.S. 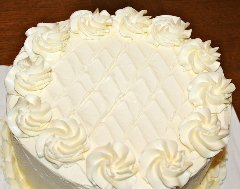 Our cakes are ALWAYS made from scratch, never boxed mixes) So if you weren't able to get spring treats from us this weekend, try this out! Just visit this website to make this fun cake! Who is Celebrating Mardi Gras?! Anybody planning to celebrate Mardi Gras this Tuesday? It doesn't seem to be quite as big a deal here in Watertown, WI as it is in New Orleans, but I'm sure there will be plenty of people out and about wearing crazy beads! Here's a recipe to make this deliciously fun dessert for Fat Tuesday! This recipe makes 2 cakes serving 8 people each. If you decide to use the plastic baby, don't forget to tell your guests to watch out for it in their piece! 1. Scald milk, remove from heat and stir in 1/4 cup of butter. Allow mixture to cool to room temperature. In a large bowl, dissolve yeast in the warm water with 1 tablespoon of the white sugar. Let stand until creamy, about 10 minutes. 2. When yeast mixture is bubbling, add the cooled milk mixture. 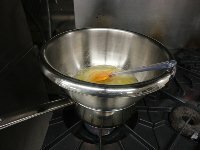 Whisk in the eggs. Stir in the remaining white sugar, salt and nutmeg. Beat the flour into the milk/egg mixture 1 cup at a time. When the dough has pulled together, turn it out onto a lightly floured surface and knead until smooth and elastic, about 8 to 10 minutes. 3. Lightly oil a large bowl, place the dough in the bowl and turn to coat with oil. Cover with a damp cloth or plastic wrap and let rise in a warm place until doubled in volume, about 2 hours. When risen, punch down and divide dough in half. 4. Preheat oven to 375 degrees F (190 degrees C). Grease 2 cookie sheets or line with parchment paper. 5 .To Make Filling: Combine the brown sugar, ground cinnamon, chopped pecans, 1/2 cup flour and 1/2 cup raisins. Pour 1/2 cup melted butter over the cinnamon mixture and mix until crumbly. 6. Roll dough halves out into large rectangles (approximately 10x16 inches or so). Sprinkle the filling evenly over the dough and roll up each half tightly like a jelly roll, beginning at the wide side. Bring the ends of each roll together to form 2 oval shaped rings. Place each ring on a prepared cookie sheet. With scissors make cuts 1/3 of the way through the rings at 1 inch intervals. Let rise in a warm spot until doubled in size, about 45 minutes. 7.Bake in preheated oven for 30 minutes. Push the doll into the bottom of the cake. Frost while warm with the confectioners' sugar blended with 1 to 2 tablespoons of water and vanilla. If desired, sprinkle the icing with colored sugar sprinkles (purple, gold, and green are the Mardi Gras colors!) while the icing is still wet.